Most of these students would be the first in their families to go to college, thanks to Marty Burbank's donation. Two mothers ran to hug and thank a stranger at Rio Vista Elementary School in Anaheim last week. Few words were spoken, given a language barrier, but there were tears of joy. The stranger, Marty Burbank, will be paying for their kindergartners to go to college. Burbank is pledging to fund each student's tuition for two years at community college and two years at a California state school -- or the equivalent if they want to attend elsewhere. All they have to do is draw a picture or write an essay each year about what going to college will mean for them and their families. "I'm a strong believer in visualizing your goals, and this way they'll be thinking about this each year for the next 12 years," he said. Both Burbank, an attorney and Navy veteran, and his wife Seon, a professor at Vanguard University, were the first in their families to go to college. He estimates the tuition will cost about $1 million by 2032 and has set up a private foundation where he'll contribute some funds each year until there's enough. All 26 students in Tessa Ashton's kindergarten class speak Spanish at home. They arrived at school the first day knowing little English, or ever hearing much about college. But Ashton makes a point to talk to them about college every day. "I tell them that they need to sit and listen, because that's a skill they'll need when they go to a place called college," she said. Many students at Rio Vista Elementary, may never be able to afford college. But these 26 families won't have to worry about that anymore. "I thought, let's take that financial burden away and maybe these kids will get more encouragement about going to college," Burbank told CNNMoney. A few months ago, he was set on buying a boat and had his search narrowed down to two choices. But his pastor's sermon one Sunday about charity and sacrifice changed his mind. "I thought that buying a boat at that point would be a selfish thing," he said. Burbank has donated time, money and supplies to Rio Vista Elementary and its teachers several times over the past four years after meeting Ashton at church. A school-wide initiative encourages students to think about college there. Each teacher chooses a specific university to focus on for the year and flies the school flag outside the classroom for "College Fridays." Ashton's classroom is decked out with Indiana University garb, her alma mater. 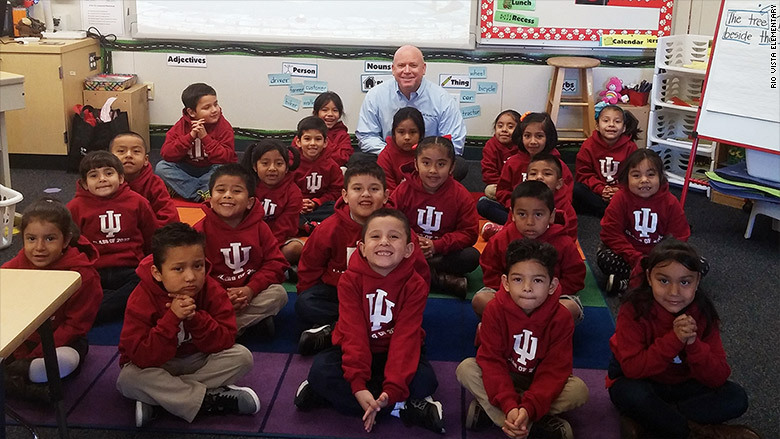 And Burbank gave each student an IU sweatshirt and t-shirt with "Class of 2032" printed on it. "The idea is to give them this vision that college is as much a part of their future as high school or middle school," Ashton said. The generous donation will hurt the couple's finances a bit. Burbank, 51, plans to delay retirement and keep driving his truck for a few more years than expected. Burbank wasn't seeking attention, and was able to keep the news between just him and the school for about a month. But now that word has gotten out, he does hope it might inspire others to do something similar in their own communities. "It doesn't have to be a whole class. Picking up the tab for one child can really make a difference," he said. It certainly has for 26 families in Anaheim. "Suddenly they can dream about a different future for their child, that's pretty remarkable," Ashton said.